Decipher the cryptic clues and complete Street Fighter 5’s missions for fight money. Street Fighter 5 Arcade Edition is out now, and with the release of the new expansion to the game the developers at Capcom have tightened up the rules for earning fight money. One of the best ways to earn is still in, however – special missions that are delivered to players and changed up regularly to ensure players always have something new to do. Missions are exactly what you’d expect: small tasks that when completed have a Fight Money bounty. All missions are limited time and when one expires a new one will appear, so completing all of these as they arise is a great way to rack up a lot of Fight Money. 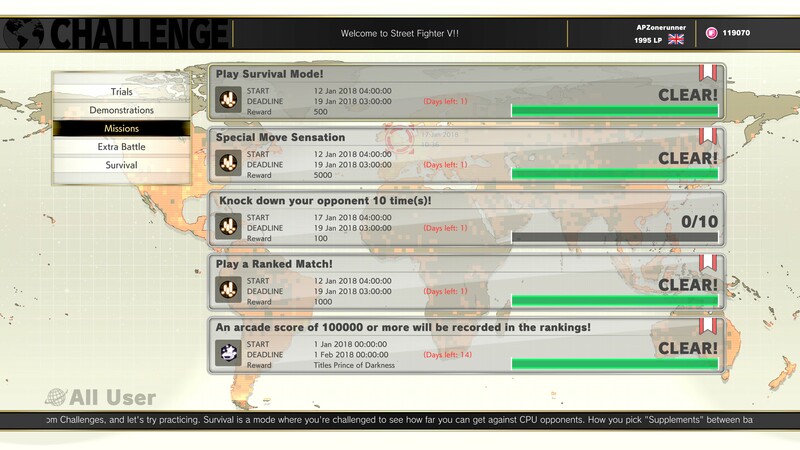 On this page, we detail how to complete every mission SF5. The trigger for unlocking this challenge can be found in the epilogue chapter of Ken’s character story in Story Mode. Just go to the character stories, pick Ken, and play through Ken’s story. As part of the story sequences there’ll be reference to a special dress that his wife Eliza owns, and when this reference takes place this mission will pop as completed. The other missions for this week include Use Fight Request to play a Ranked Match (500FM), Play Story Mode (250FM), An Arcade Mode score challenge (for a title) and move-based objectives for performing certain actions ten times. There’s also a new Crossover Costumes up for grabs in Extra Battle this week, plus a Shadaloo Soldier you can beat for extra Fight Money. As ever, all missions expire over the course of this week. First off, here’s the Character Story Missions. These cryptically-named missions will be solved by going to a particular character’s story and either finishing a battle or viewing the story sequences there. Easy fight money! This one is found in Dhalsim’s character story in the chapter when he fights R. Mika. Go through the scene, beat Mika, and in the post-fight story sequence you’ll complete this mission. To complete this challenge, you simply need to open up the character stories and pick Karin. In her epilogue Sakura makes an appearance, and seeing that completes this challenge. The trigger for unlocking this challenge can be found in the epilogue chapter of Ken’s character story in Story Mode. 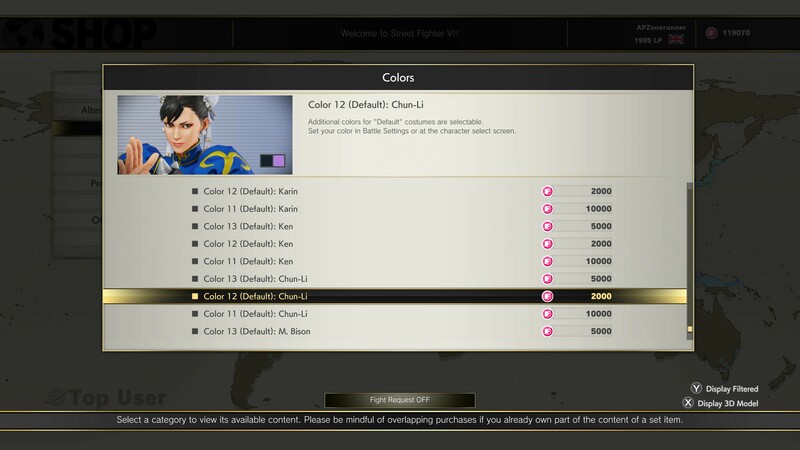 In the Story Mode menu select Character Story and pick M. Bison. Play through the battles and story sequences to complete this mission. In Versus Mode go to the Bustling Side Street Stage. Knock your opponent out at the end of any round on the left-hand side of the stage. This will open up the restaurant, and when the match ends this challenge will be completed. In Versus Mode go to the Bustling Side Street stage and knock your opponent out at the end of a round on the far right edge of the stage. They’ll be knocked into the bus, completing this mission once the match ends. Once again head to Bustling Side Street in Versus Mode. On the left side of the stage there’s a large, breakable neon sign. It has five sections, and you’ll want to break them all by using attacks and knocking your opponent down near the sign. We wouldn’t want the sign falling on someone else, so smash it… Safety Measures, y’see? Complete the match to verify this mission’s completion. For this challenge head to Versus Mode and go to the Underground Arena stage. There’s a bear in the background here. Friendly chap. If you score knock-downs near the bear, eventually he’ll react to that – and when he sits down (thus respectful spectating). I found he tended to fall over more with multi-hit knockdowns such as hard uppercuts or Cammy’s Heavy Kick Spiral Arrow. Finish the match to complete the challenge. In Versus Mode head to Hillside Plaza as your stage. There’s a Toucan in the background towards the right of the stage. Score enough knock-downs near them and they’ll react, like the bear in Respectful Spectating. Eventually they’ll swoop down upon a knockdown and steal fruit from the vendor – this is the mission trigger. Close out the match and the mission will clear. Head to the City In Chaos stage in Versus Mode. There’s a red vehicle in the background that’s flipped over. Score knock-downs near that vehicle until the guys trying to turn it right side up again succeed in doing so, and then finish the match. Challenge complete! In Versus Mode load up the regular version of City in Chaos in NYC. Head to the far right of the stage – there’s an NPC drinking near a fire hydrant. Knock over your opponent near the fire hydrant until it bursts. Finish the match to complete the mission. Load up Versus Mode and head to the regular version of the Kanzuki Estate. You’re going to want to set the match to 5 to have the best chance of getting this one right. On the stage there’s three ninjas in the background, and your aim is trigger their animations – they are the special move sensations! This is most easily done by using a special move. They’ll animate differently if you’re successful – I was able to get it by using Cammy’s Spiral Arrow to knock down. Sweeping the leg works too. When the match is completed, the ninjas will slide down a rope in the background. The mission will be complete. Go to Versus Mode and load up the regular version of the Kanzuki Estate stage. Head to the far right and you’ll find the chef and a maid. When you knock your opponent down near them, they react. To complete Ishizaki’s Appeal, score enough knockdowns and the maid will hit the chef with her tray. Finish your match to claim your fight money. It’s off to England we go – in Versus Mode, load up Union Station in England. There’s lots of caricatures of Britishness here, but we’re looking for one funny guy – a clumsy guy. Move to the far left of the stage and you’ll see a janitor in the background. Keep knocking your opponent down near him until he’s shocked and falls, his head landing in his bucket. Mission complete – you’ll get paid when you finish the match. In Versus Mode head to the regular version of the Forgotten Waterfall stage. In the far right corner of the stage there’s a cave-like opening, and it’s in here you’ll find the Short-Tailed Bat Colony. Keep knocking your opponent down over here and eventually bats will fly out of the cave. Complete the match. In Versus Mode pick Dhalsim and head to Apprentice Alley. Datta just wants to see his boy Dhalsim fighting, basically. Win the match – it’s that simple! Select Versus Mode and then pick the Apprentice Alley stage. On the left of the screen there’s a sleeping dog… you can see where this is going, right? Knock down your opponent near him repeatedly to wake the pup up. Go to the Shadaloo Base stage in Versus Mode. On the far right of the stage there’s a cache of missiles. Well, if it’s only missile disarmament, it’s going to involve these. Score knockdowns near the missiles to force them to accidentally launch. Once all four launch (this doesn’t have to be in one round), the mission will complete once the match is over. In Versus Mode pick one of the four kings of Shadaloo – FANG, Vega, Balrog or M. Bison and battle on the Shadaloo Base stage. This is how you unlock ‘We Salute Thee, Four Kings’ – simply win a match and the Shadaloo grunts in the background will salute, completing this challenge.